As a child, you were excited when you lost a tooth. You probably wiggled and tugged on it using all sorts of tricks, just waiting for that perfect moment when it would finally come loose. But as an adult, you aren’t as keen. Losing a tooth can affect not only how you look but also how you chew and speak. Although you could get a dental bridge, the best, most advanced restoration option for one or more missing teeth is often a dental implant in Mount Pleasant. To better understand how dental implants work today, we can look at how they have been developed over time. Conceptually, dental implants started showing up thousands of years ago and have included materials like ivory, gold, iron, and platinum. In ancient China, temporary dental implants made of bamboo were used. In Egypt, decorative tooth replacements were inserted post mortem. The first permanent dental implant was found among the ancient Mayans, where the jawbone showed signs of fusing with the shell tooth replacement. Also, transplanted teeth from other humans or animals have been relatively common in archaeology, but the risk of infection or implant rejection makes this method unsafe and unreliable. Before 1952, the various implant materials used hadn’t yielded successful results. Then, an orthopedic surgeon found that titanium fused with bone, and he hypothesized that it could work in the field of dentistry as well. 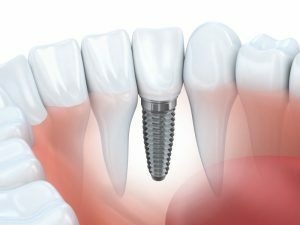 The first titanium dental implant was placed in 1965. Subtle advancements, such as a screw design for the post, have been implemented since then. Today, dentists use a titanium alloy screw to fuse with the jawbone and place a dental crown over it. In some dental practices, the success rate is up to 95%, and it is considered the most advanced form of tooth replacement. First of all, dental implants don’t put additional stress on the remaining healthy teeth like dental bridges do. Dental implants look and feel more like natural teeth. You can chew, talk, and smile with more confidence. Because the post fuses with the jawbone, it stops the bone from degenerating, which can lead to further tooth loss. With proper maintenance, dental implants can last for about thirty or more years. Although dental implants cost more initially, the long-term cost for other restoration options adds up because of adjustments, new prosthetics, or expensive cleaning solutions. Take advantage of the best that dentistry has to offer to restore your smile. Talk to your dentist in Mount Pleasant to see if dental implants are the right choice for you. A native to Mount Pleasant, Dr. Robert Sikes has been practicing dentistry for more than thirty-three years. Whether you need a complete smile makeover or simple treatment on one tooth, Dr. Robert C. Sikes provides patients with an approach to oral health care that promises comfort, expertise, and beautifully personalized results. Contact him by calling (903) 572-9720 or clicking here.